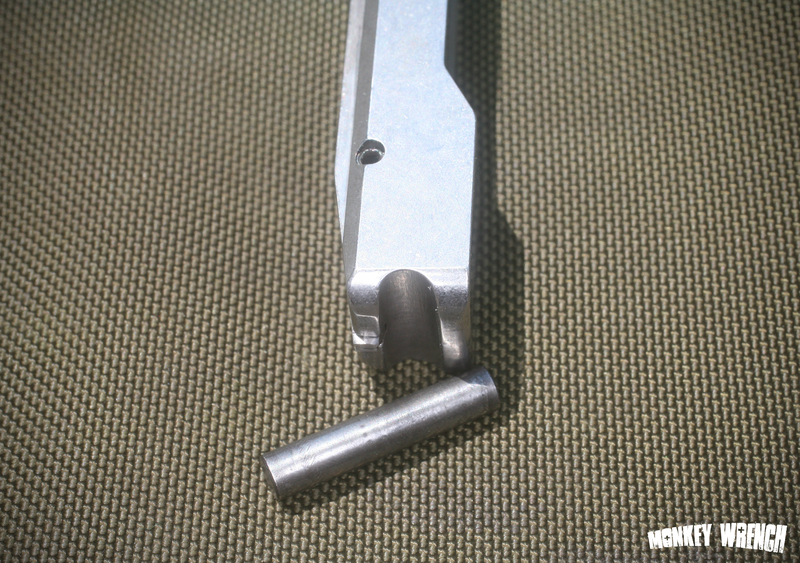 Over time, the steel buffer pin will “egg out” the receiver hole it’s installed in. Remember, the steel bolt hits the buffer, the buffer pin is steel, and the receiver is cast aluminum. It is only a matter or time before this happens, and when it does happen, repair of the receiver will not be feasible due to the cost of the receiver. Sound. 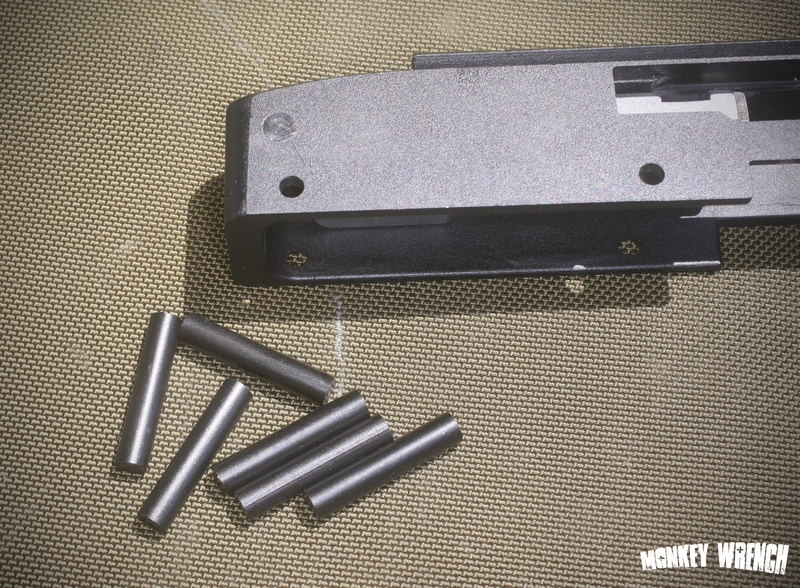 The sound that the bolt makes as it hits the buffer pin is a loud metallic “clang” that can clearly be heard. 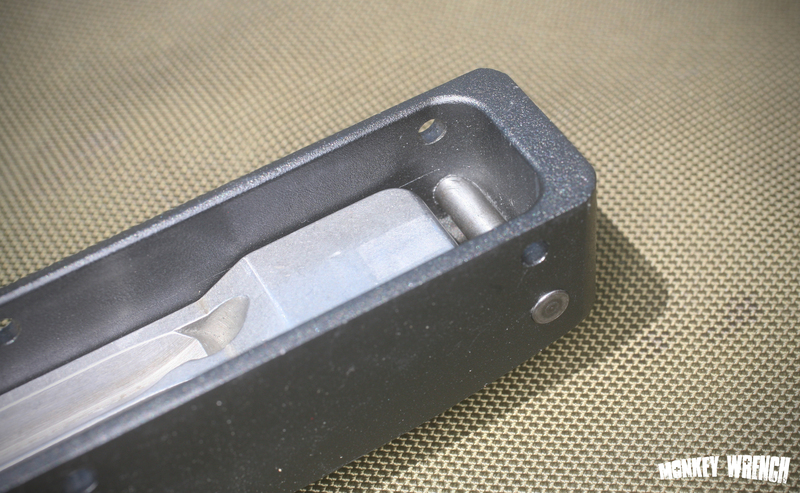 As the holes get elongated, as pointed out above, the now loose buffer pin will then make a metal-on-metal sound with a rattle to it, as it bounces around in the cast aluminum receiver.This sound is even more noticeable when the rifle is shot suppressed, and the loudest thing to the shooter is the action of the rifle. And that brings us to “What“. Monkey Wrench is proud to introduce to you, our very own Polyurethane buffer. A buffer made to the exact dimensions for the Ruger 10/22 receiver. Made from a high density black Polyurethane with a durometer rating of 80A, resistant to temperatures up to 180F, it is ideal for buffer usage. 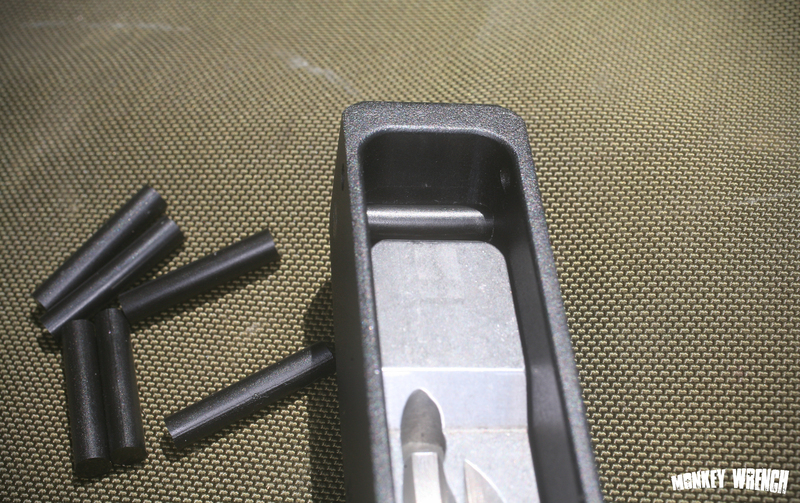 After making sure the rifle is unloaded, simply remove the rifle from the stock by unscrewing the screw at the bottom of the stock, just forward of the magazine release. Once it is out, located the buffer hole, the most rearward and top hole in the receiver, and tap out the steel buffer pin. Then, simply insert the new buffer. It may require some effort, as the holes in the receiver may be filled with dirt, grim and possibly burrs. Once it’s in, reassemble the rifle, and you’re done! Monkey Wrench will be selling these buffers in sets of 2, for $15, shipping USPS in the CONUS. Email me at dan@referenceonly.com if you’re interested! This entry was posted on June 12, 2011 by Dan. It was filed under 10/22, General and was tagged with 10-22, 10/22, 10/22 buffer, buffer, monkey wrench, Rimfire, Ruger. following establishing it largely within the United states and You.K. those require a connect-in installation).